Air Conditioning Energy Saver - Re-Green Bangla Industries Ltd. The World needs more efficient air conditioning. We have the solution. Each year air conditioning systems consume more than one trillion kilowatt-hours of electricity. In warmer climates, or during hotter periods of the year, they can represent as much as 50% of total energy consumption at an organizational level. 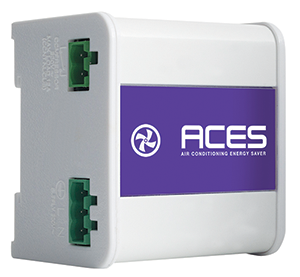 Our Air Conditioning Energy Savers (ACES) are used to reduce the energy consumption of commercial air conditioning systems across the globe, improving comfort levels, equipment performance and reliability at the same time. Air conditioning systems are designed to reduce, and then maintain, internal building temperatures by providing force-cooled air until a predetermined comfort level is achieved. These systems are generally switched on or off automatically in a series of cycles via a time clock or room thermostat, in many cases combined within a simple programmer. ​Air is taken from the internal environment and is passed over a series of coils within the system to extract the heat. The energy intensive compressor cools the coils. Typically, compressor and fan run continuously until the room thermostat is satisfied. A large part of the system’s energy consumption is associated with the compressor, which is often oversized for its application. The compressor often continues to operate without beneficial effect on the environment as a result of the effect known as thermodynamic saturation. Thermodynamic saturation occurs as cooling takes effect and temperature differentials between air entering and leaving the system narrow. The system continues to cool air needlessly, with the compressor consuming energy without benefit. 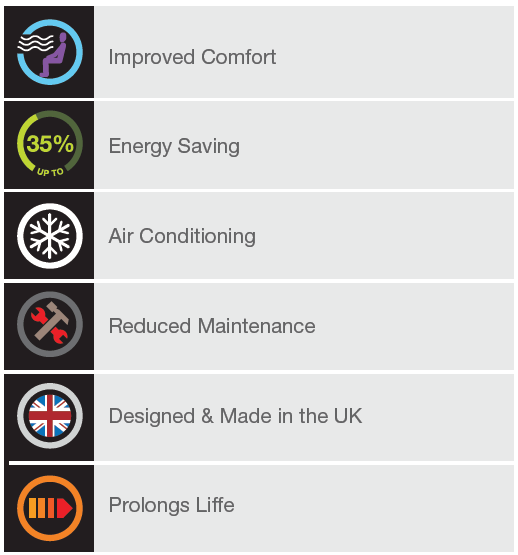 The ACES Standard ensures that your existing air conditioning system performs at its most efficient by directly addressing the issue of thermodynamic saturation. Through advanced temperature sensing and control algorithms ACES Standard identifies the exact point at which thermodynamic saturation is reached and switches the compressor off. Any latent cooling potential still present within the coils is utilized through continued operation of the system’s fan, which only uses a negligible amount of the overall energy consumption associated with air conditioning.